A very special “thank you” to SHTA member, Lemeul L Marsh for sharing these photos and the comments that go with them! 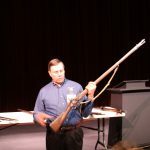 George Elmore, National Parks Service, Historic Weapons Instructor gave a program on the firearms of the frontier. 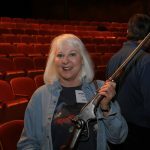 Leigh Geyer holds a Spencer rifle, which was a popular rifle on the High Plains. 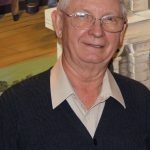 Mike Baughn served as president of the Association through most of its history. His leadership kept the organization alive and moving forward. Mike is a highly organized person and his attention to detail served the Association well. Mike is also a historian, writer, and highly sought-after speaker. Sam Chestnut served as treasurer of the Association for many years. Sam guided the organization in financial planning and kept detailed records of the Association’s finances. Sam’s leadership and counsel was important to the Association. 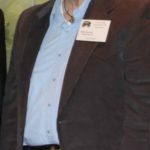 As I said earlier, there are far too many people who have a been a valued part of the Smoky Hill Trail Association to name them all in these posts. The 6 people highlighted played a key role in starting the organization and helped it grow. 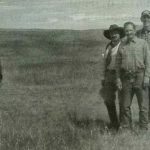 There were many people who helped the Smoky Hill Trail Association get started. There are far too many to mention in one post but I wanted to recognize some of the early people who influenced the organization. 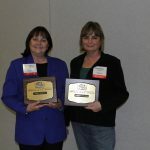 These two ladies were the prime organizers of the Association and they worked tirelessly to make the organization successful. On the left is Jody Zeman. Jody was the organization’s secretary for many years and was the prime organizer of conferences and provided the structure for the business end of the organization. Donna Malsom. on the right, was the driving force behind the creation of the SMHT Assoc. and she provided the leadership to get the organization up and running. Unfortunately, we lost Donna to a sudden illness. Her death was a great loss to the Association. These two gentlemen are very knowledgeable historian who helped the Association in many ways. They, among others, provided the historical facts of the Smoky Hill Trail. Jim Gray is on the left. Jim was one of the leaders of the Association and organized and guided most of the conference tours. Jim is an accomplished author. For years he wrote a newspaper about the history of this area and he wrote a book called “Desperate Seed” about the history of Ellsworth. Leo Oliva is on the right and he is the one who came up with the idea for the Association. Leo has provided leadership and historical guidance. Leo is also an accomplished author. Among his many publications is a series of books about the forts in Kansas. 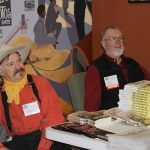 The book on the table, “Tales of the Smoky Hill Trail” by Raynesford and Lee, is considered to be the main historical reference on the Smoky Hill Trail. The book is available from the Last Chance Store. For a book call or e-mail, oliva@ruraltel.net , (888) 321-7341 Both of these men are also well-known speakers.